Perhaps I’m sensitive, but there doesn’t seem to have been much debate about whether the current UK floods are linked with climate change. The connection has appeared for a day or two but has never been the story for long. I’m going to look at this in two ways: firstly, what it’s meant for public opinion, and secondly, why it matters. 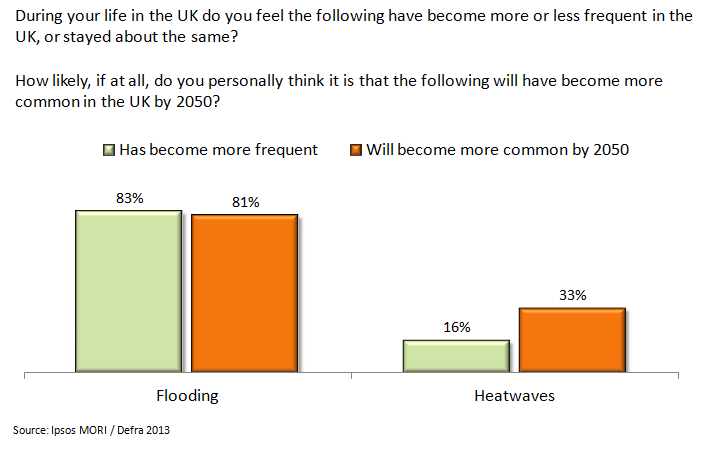 A Defra poll last year found people overwhelmingly think that flooding has got more common, and will continue to do so*. 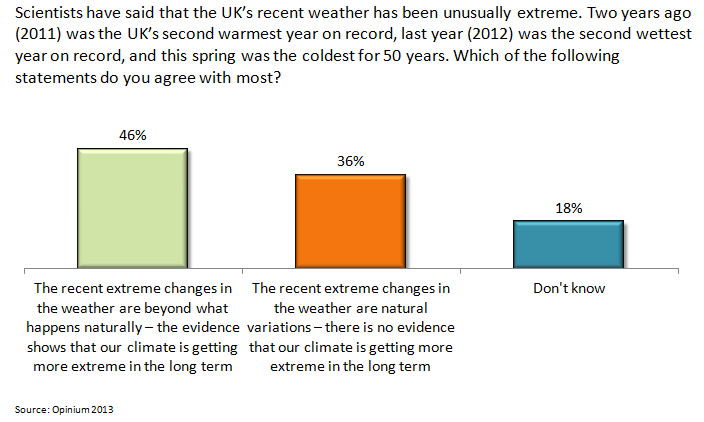 The last Carbon Brief energy/climate change poll tested how far record-breaking weather of the last few years is seen as linked with climate change. It found just under half think they’re linked: a plurality but hardly decisive. The only poll I know of asking whether people connect these floods with climate change, by YouGov, found a roughly even split, with slightly more saying they’re probably not linked. This was done before the Met Office published their report making a link, which got a bit of coverage. But as Carbon Brief have shown, only a small proportion of news articles about the floods have mentioned climate change, so it would be surprising if opinion has changed hugely. It’s contentious to say that climate campaigners should be declaring that these floods are the result of climate change. On the one hand, it seems plausible to say they are climate-related, because they’re exactly the kind of thing that’s projected to happen as a result of climate change, and they’re unlikely to have happened without the effects of human-caused warming. But on the other hand, it’s possible they might have happened without climate change – so we can’t be certain. But here’s the problem: we will never be certain that a particular weather event is linked with climate change. And showing what climate change means for the UK is a really good way of explaining why we need to tackle it. If we wait until we’re utterly certain – as opposed to just very confident – we’ll miss the last boat evacuating the village. So, there’s been very little discussion of the likelihood that this kind of weather and consequent flooding, which are freakish at the moment, will become increasingly normal. To give just one example of why that matters, there’s been a bit of buzz about the idea of building a lagoon in Bridgewater Bay. It would generate electricity and cut flooding in the Somerset Levels. Sounds a great idea, but it would cost a bomb and take years to build. If that buzz fades after a few months – because we don’t connect these rains with climate change so don’t think they’re likely to happen again for another 200 years – we might wait until a few more rounds of serious flooding before we even get started with the planning process, which would mean thousands more people flooded when we could have acted sooner. The flooding, being so dominant in the news, is a time when climate change could be part of everyday conversations and the consequences of its unmitigated impacts for the UK could be made clear. World-leading scientists are prepared to say that human activities have made these floods more likely – and that they’ll become increasingly common if we don’t act. Yet climate change has barely registered and as a result there has been very little discussion about how we stop these floods happening again in a world where more extreme weather will make them more likely. It may be too late to change the debate during this set of flooding, but it needn’t be the case next time. * In isolation, this question looks like it could be to do with planning decisions rather than just climate change. But in practice, it followed a question about long-term changes to the UK’s weather and is in a series with others about dry periods and snowfall etc, so I think it’s fair to assume it was interpreted as a question about climate change. This entry was posted on Tuesday, February 11th, 2014 at 22:13	and is filed under Climate Sock. You can follow any responses to this entry through the RSS 2.0 feed. Both comments and pings are currently closed.